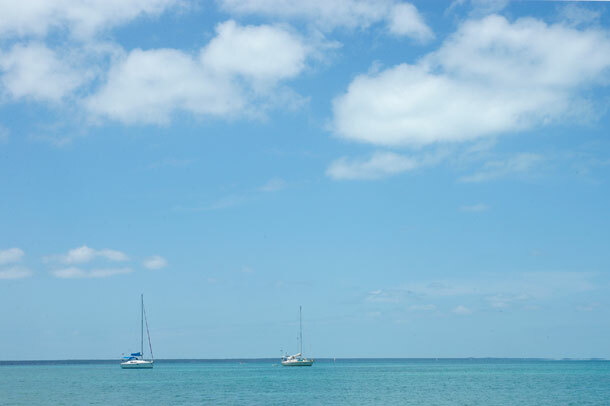 Blue Wing (on right) with Jeff and Jule’s charter boat in the harbor at Manjack Cay. This is the first time Blue Wing has had a buddy boat! 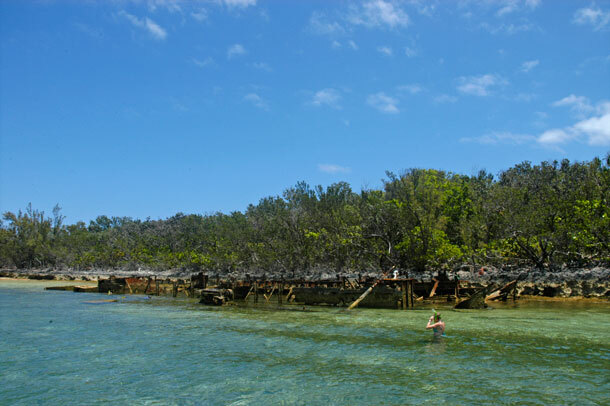 The afternoon of Wednesday 4/24 we are in Baker’s Bay off Great Guana Cay in the Abacos. We are really enjoying getting to know Jeff, Jules, and Neil who arrived in Marsh Harbor yesterday to charter a 36 foot Jeneau sloop for a week. They are friends of our friend Karen. We have never met them. We saw them briefly this morning, and yelled from boat to boat to confirm that they still planned to sail to Baker’s, then we went ahead so we could prepare to have them over for pizza night. They have a full itinerary, but we think we will have enough energy to hang with them for the first few days. Jeff and Jules have a plan. They sound a lot like we did a few years ago. They want to live near the coast, buy a boat and get to know it, crew on other boats to build experience, and then go cruising. In other words, wade in instead of diving in like we ended up doing. They are already on track and we are sure they will realize their dream. 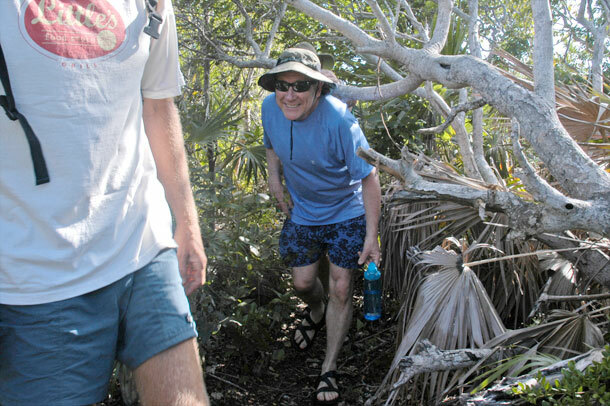 Neil loves nature and already seems at home here in the Bahamas. He recognized many of the fish they saw while diving at Mermaid Reef this morning. He already knows that the Baker’s Bay golf course near us is controversial. Many claim that fertilizer drain-off is killing the nearby reefs. After we chat for a while, they go off to snorkel and come back for supper. They bring gifts — chocolate ones we would probably never go out and buy, but will definitely enjoy eating. A good time is had by all. 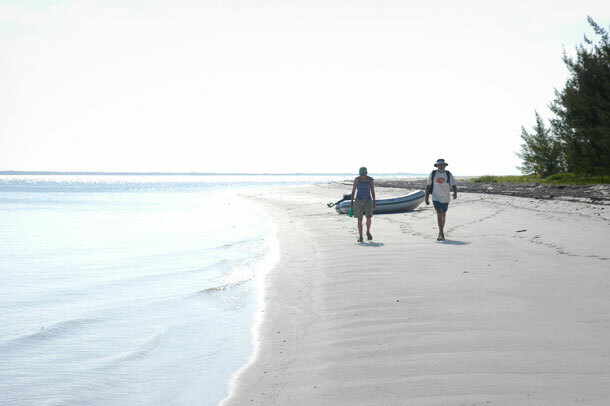 The next morning we follow them, motor-sailing in light wind through the Whale Cay cut to the northern Abacos. Once we are through the cut we stop the engines (I think at about the same time) and use what little wind we have to go to Manjack/Crab Cays. They want to stop at Manjack for lunch. After lunch we dive on the eastern wreck off Crab Cay. The wreck is shallow and the tide is low, but we still see plenty of fish. No one compares it to all the superior dives they have done elsewhere. They just appreciate it for what it is. Duwan and I like that. With better wind we sail up to Powell Cay. We walk a trail to the beach side for a little exploring. Then we have supper on their boat. Again, we have a lot of fun. Friday they plan to head back south. 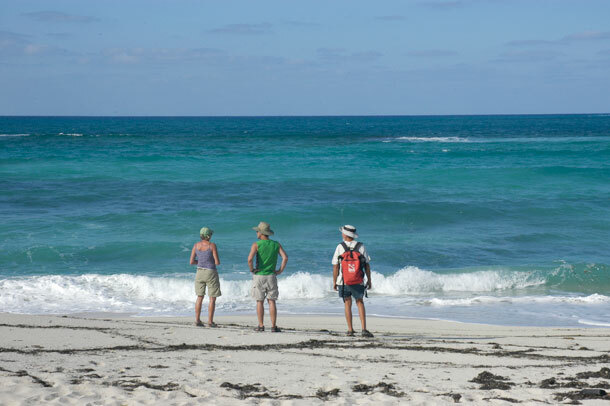 We had talked about going with them as far as Green Turtle Cay, but we really have a plan to go north (more next post). Also, two party nights in a row is about our limit. So we row over, wish them good weather (which they had), and part ways. It was well worth our time to plan to be in Abaco to meet these folks. We look forward to seeing more of all three of them when we get back to Atlanta. And, oh, the chocolate was delicious. Greg, Jeff, and Jules in the water at Manjack Cay. 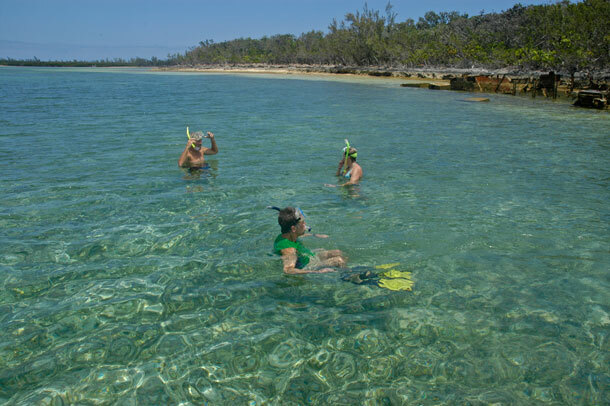 Snorkeling the wreck at Manjack Cay. 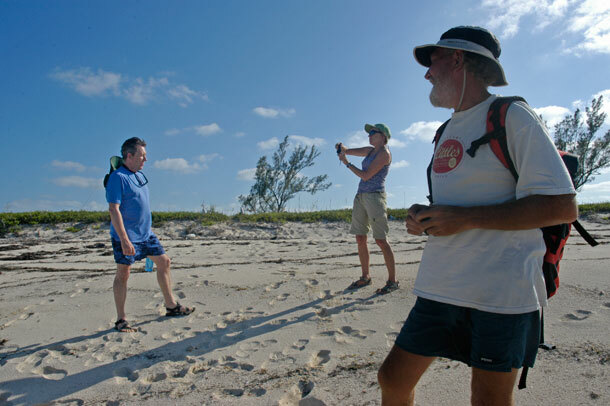 Jules and Greg walk along the harbor side of Powell Cay looking for a trail to the Atlantic side. 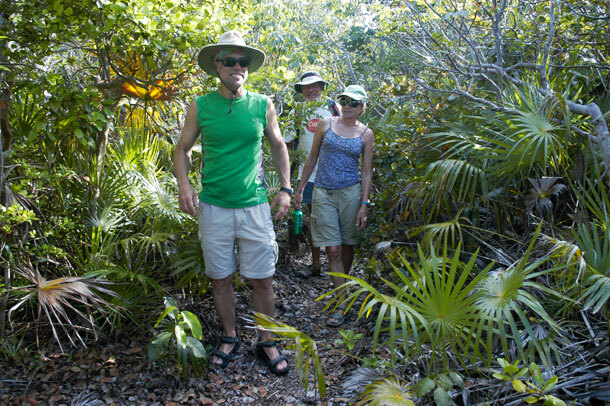 The trail across Powell Cay was rather well marked and nicely trod. Jeff remarked on all of the trash on the trail. Nope, those are trail markers. Neil ducks under a tree on the trail across Powell Cay. It is always breathtaking after coming off a trail to the beach side of an island and seeing the water and waves come roaring towards the shore. Gotta have a pic for all of the friends back home. 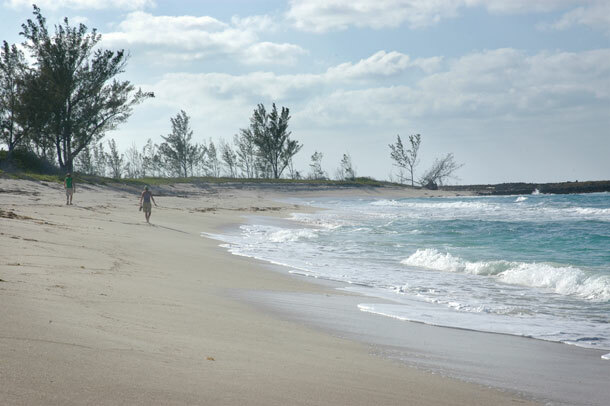 Jeff and Jules walk along the Atlantic beach side of Powell Cay. 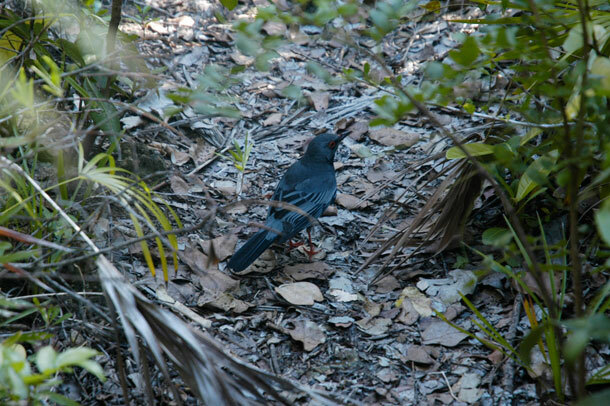 Unidentified bird on the trail across Powell Cay. This entry was posted in Life on the Water, The Abacos, The Bahamas and tagged Sailing Friends. Bookmark the permalink. Great post! We felt lucky to meet y’all and have so much in common besides our love of sailing. Of course, Karen wouldn’t have made the connection if it was not meant to be. Looks like we left at the right time, weather-wise! Oh, and we met a woman at the Atlanta Spiritual Center today who owns the pretty little beach-cove with hammoks and tiki hut on Manjack! She lives in Atlanta half-time. you’ll have to meet her. Another killer post. Keep the adventures coming!